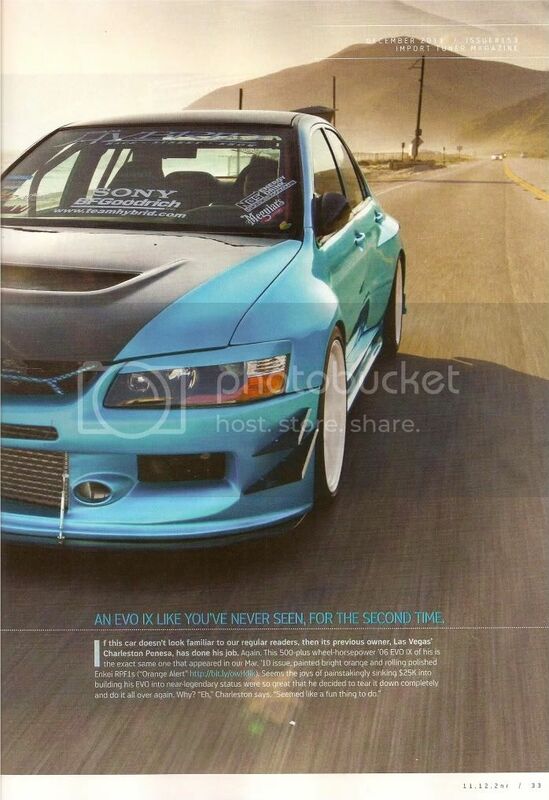 Congratulations to LV Chapter, Essex Olalia's 2006 Mitsubishi Turbo-APR Evil-R Widebody-Teal EVO IX in a 6 page full feature in Import Tuner Magazine November issue, pgs 032-37. Title of Article is called, "EVOLUTION." IT wrote, "If this car doesn't look familiar to our regular readers, then its previous owner, Las Vegas' Charleston Penesa, has done his job. Again. 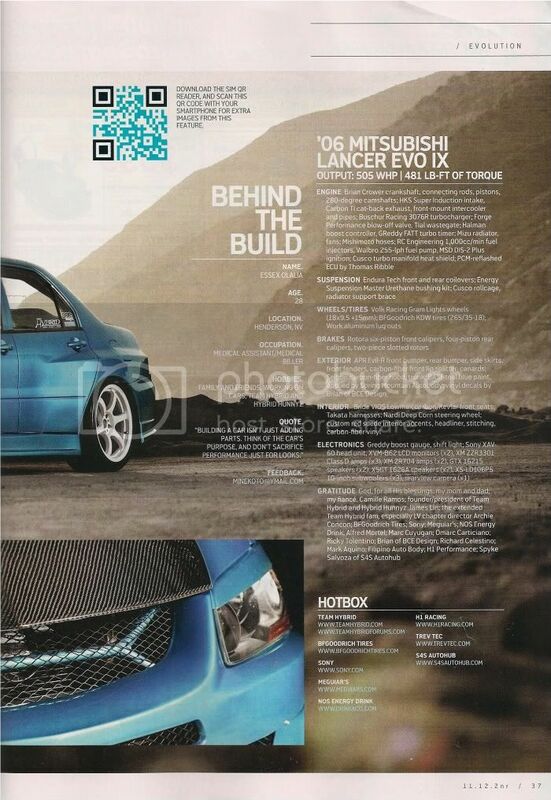 This 500-plus wheel-horsepower '06 EVO IX of this is the exact same one that appeared in our Mar. '10 issue..."
IT wrote, "Now might be a good time to drop a little Team Hybrid knowledge. Founded in 1995, they quickly grew to become the pioneers of SoCal import culture in its hey day, their brightly colored, highly modified rides serving as flagships for the import movement in the public eye. Picture yours typical Southern California-tuned import, and the image that springs to mind is undoubtedly along the lines of something Team Hybrid's built over the year. 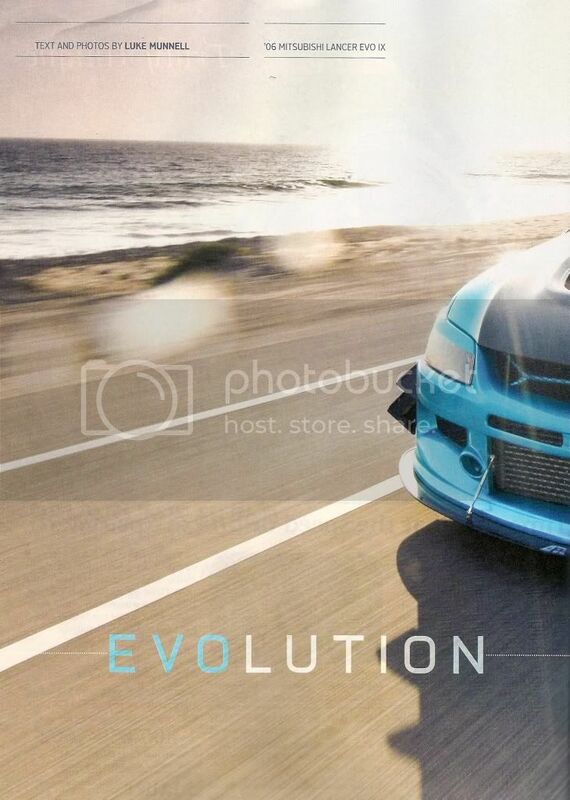 An original Team Hybrid member, Charleston has been able to exhibit that flare in everything he's built, with this EVO first in its bright orange iteration, and now in thie teal/white second coming." IT wrote, "When we arrived in Oxnard, Ca...we were surprised to learn Essex Olalia, fellow Team Hybrid member, now holds the keys to this beast..."
IT wrote, "And in standard Team Hybrid dedication, he drove it from Las Vegas for our shoot-across hundreds of miles of desert, over some mountains, and through L.A. traffic. 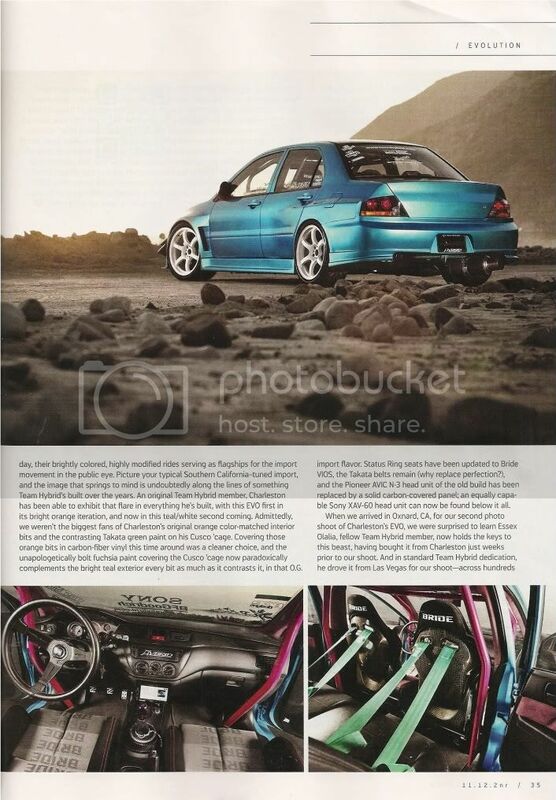 IT wrote, "As Team Hybrid President James Lin points out, gutted, track-prepped cars make crappy daily drivers, just as ground-scraping, fiberglassed show cars do, or anything with an overbuilt engine requiring race fuel, constant rebuilds, or huge payoffs to make "technically" legal." IT wrote, "It turns out not everyone's a fan of that classic import style-a testament to Team Hybrid's evolving presence in the modern day." Essex, thank you for the shout out in the gratitude section. Essex said, "...Gratitude, Founder/President of Team Hybrid and Hybrid Hunnyz, James Lin; the extended Team Hybrid fam, especially LV Chapter Director, Archie Concon." ps. 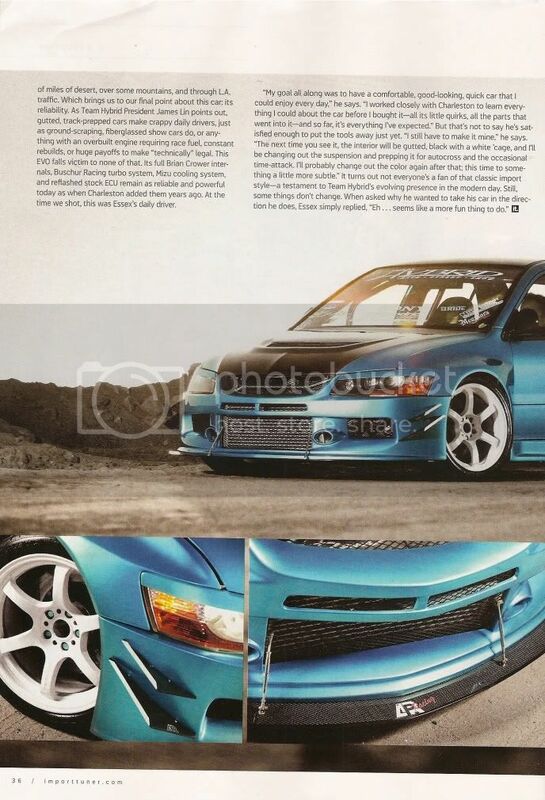 How many import teams currently out there can claim they had the same car published twice in the same national magazine with a full feature and almost, the second time around, the cover ......? 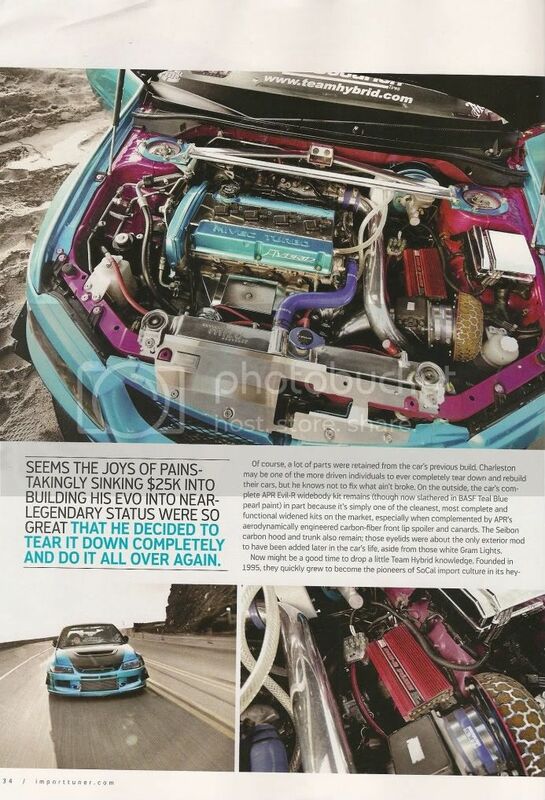 At Team Hybrid, always innovating and continuing our tradition to be 1st to many of the import accolades and records. Team Hybrid - Est. 1995. ©2018 Team Hybrid & Hybrid Hunnyz. This site is best viewed in Firefox.